Investors: It’s time to wake up. The global shift to renewables and green energy is happening—and, in our view, it’s accelerating at a pace faster than previously anticipated. Disruption within global energy markets is roiling through dozens of industries and upending centuries-old ways of doing business. We are at the inflection point. From here, there is no turning back. Disruption, innovation—the Internet—this has led to a Cambrian-style event that is going to dramatically change how companies and entire industries operate. In a disrupted vertical, incumbents lose their edge. This theory holds true in cloud computing, retail, cars—and now, energy. It’s our prediction that over time, the incumbents—i.e. oil and gas providers, traditional automotive companies, etc.—will suffer massive casualties. They will move too slowly because they are hampered by out-of-date business models and legacy thinking. This is the innovator’s dilemma out in the wild, and it is currently playing out in the global energy sector. The future is here, and we are living it. We expect other savvy manufacturers to follow in these sorts of verbal commitments, but we are unconvinced that legacy players can meaningfully pivot their business models. After all, we’ve seen this play out before in other industries. This makes the market appealing from an investment perspective. As century-old auto-makers and gas providers view this landscape with increasing trepidation and fear, we view a bright, clean future. As investors, we are not encumbered by such out-of-date legacy business models or old-school thinking. Our focus is on researching the future—and participating in the enormous transfer of wealth that results when industries collide, explode, and get disrupted. As the title of this report suggests, we firmly believe there is a ‘revolution’ in the works for renewable energy. It’s an exciting time. And we’re ready for it. Clean energy technology is becoming more affordable, more accessible, and ultimately more desirable. We also remain unconcerned and unconvinced that politics—specifically the American withdrawal from Paris Climate Accord—will have a meaningful impact on the investment and development of renewable energy technology. This paradigm shift creates a fantastic environment for investment. In this paper, we will cover a range of subjects related to green and renewable energies, the steady decline of fossil fuels, and the rise of wind, solar, and hydropower. We will present our viewpoint on the future of renewable energies, but we will also present relevant research and data for you to make your own informed decisions about the future landscape of energy in the 21st century and beyond. Ultimately, this report is apolitical and has no secret agenda: We simply want to share our viewpoint and educate you on the what we see as an incredibly exciting shift into the modern energy economy. Renewable energy is no longer a pie-in-the-sky theoretical idea; the shift to green is being fueled not just by common sense—but by economic and business realities. How to think of the scope? Some facts to help guide your thinking on renewables. Before we get into some of the more nuanced details, hare a few facts (and a few recaps) to consider as you read through this report. The revolution is driving prices down. The price of solar panels has fallen 50% between 2016 and 2017. - Morgan Stanley, 2017. The revolution is creating jobs. Solar and wind jobs are each creating jobs at a rate 12 times faster than the rest of the U.S. economy. - EDF Climate Corps. Why renewable energy? Because sustainability will ensure the future health and safety of our planet. In the late 1800’s and early 1900’s, the American coal mining industry was in full swing, employing hundreds of thousands of people. For the rank-and-file workers, it was an incredibly dangerous profession. According to the Department of Labor, 1907 was the deadliest year in American coal mining history. About 3,242 men died from explosions, collapses, and accidents. But thousands more were plagued by more mundane, if not fatal, conditions: Chronic bronchitis, asthma, and cardiovascular ills. Fast-forward to today. Fossil fuels continue to pollute the air for millions of people around the globe, while carbon emissions—and specifically carbon dioxide—drives climate change. Coal miners are no longer on the frontlines of air pollutants. We are. Almost 50% of the American population lives in areas where air pollution levels are often “dangerously high for them to breathe,” according to a 2014 report by the American Lung Association. Despite its reputation as a clean energy state, the five cities with the worst air pollution were all in California. Los Angeles topped the list. It’s no big secret that fossil fuels are dirty and have created myriad of health and environmental issues for millions of people around the globe. However, the extent to which fossil fuels are dangerous are often downplayed. Researchers from MIT’s Laboratory for Aviation and the Environment launched a study in 2012 to track ground-level emissions. The scientists surveyed industrial smokestacks, car tailpipes, marine and rail operations, and commercial and residential heating throughout the United States. Globally, the problem is even worse. In February 2017, the State of Global Air report estimated that about 2.2 million people in India and China died from toxic levels of air pollution. In Europe, air pollution causes around 467,000 premature deaths every year, according to the European Environment Agency. Often, it’s children and the elderly who are at the highest risks of exposure. According to a 2017 report by the World Health Organization (WHO), 1.7 million children under the age of five die every year because of pollution. “A polluted environment is a deadly one, particularly for young children,” Dr Margaret Chan, director-general of the WHO, told The Guardian in March 2017. “Their developing organs and immune systems – and smaller bodies and airways – make them especially vulnerable to dirty air and water.” Relying on old, dirty forms of energy is quite literally killing the planet. It’s our belief that as these problems intensify—i.e. climate change, deaths from pollution— more governments, entrepreneurs, and businesses will also accelerate their efforts to combat them. Simply put: Renewable energies provide a safer, healthier alternative to fossil fuels, and demand and consumption of safer energies will dramatically increase over the next several years. Renewable and clean forms of energy—be it wind, solar, hydroelectric, and geothermal power—have the power to dramatically eliminate pollution, slow global warming, and transition the globe toward a cleaner, healthier environment. Having a healthier population isn’t just a humanitarian effort, either. It’s an economic one. According to the Union of Concerned Scientists, the aggregate national economic impact associated with health impacts of fossil fuels is between $361.7 and $886.5 billion, or between 2.5 percent and 6 percent of gross domestic product. Why? Clean energies simply emit less carbon emissions. Per kilowatt-hour, natural gas emits between 0.6 and two pounds of carbon dioxide. Coal emits between 1.4 and 3.6 pounds. Meanwhile, wind emits .02 to .04 pounds, solar emits 0.07 to 0.2, geothermal emits 0.1 to 0.2, and hydroelectric between 0.1 and 0.5. In Denmark, wind energy now provides enough electricity to power the entire country. In Chile, solar energy is so abundant that the government has begun to give some of it away for free. Portugal generated nearly three-quarters of its electricity from renewable energy sources. Even California is shattering clean energy records. On a hot sunny day in early 2017, 9,000 megawatts of solar fueled the Golden State, according to the California Independent System Operator. Meanwhile, residents of Iowa & South Dakota enjoy 25% of energy consumption from wind turbines. Consumers will always gravitate to companies that provide the best product at the lowest prices. This is a reality of any business, any vertical, any time period. Energy is no different. Even though fossil-based fuels currently provide about 85% of all the energy use in the world, we predict that renewable and clean forms of energy will continue to become cheaper and more reliable, and result in a dramatic customer shift towards clean energy consumption. Global climate change is hastening investments in technology that will solve environmental problems. Warren Buffett, Bill Gates, Mark Zuckerberg, Jeff Bezos, Jack Ma and other tech titans have all publicly committed to green energy investments and initiatives. At Worm Capital, we are committed to investing in sustainable, clean, and energy-efficient businesses. Sustainable investing goes by many different names—ESG, impact investing, social investing—but the core ideal is that we want to own businesses that hold a long-term look on sustainability and environmental issues. For both consumers and investors, an enticing and immediate area of opportunity to participate in the clean energy revolution is in the electric vehicle industry. We predict electric automotive adoption to increase and accelerate as supercharger networks expand, as the technology becomes more affordable, and as battery pricing lowers. This is good for consumers, it’s good for investors, and it’s good for the planet. Right now, there are several projections of electric car adoption rates over the next 20 years. On one hand, for instance, OPEC says electric vehicles will make up just 1% of all cars on the road by 2040. Bloomberg New Energy Finance, on the other hand, says it will be closer to 33%. We eschew making quantitative assessments on specific, future adoption rates, but it’s our view that electric cars will continue to proliferate rapidly as consumers recognize the long term value and cost-savings of owning a fully-electric vehicle. An expansion of charger networks throughout the country (and world). Longer-range models will continue to hit the market. More automakers will continue to offer hybrid and EV vehicles at affordable prices. Battery costs will continue to drop, especially as more Gigafactories will be built. A macro-and-micro level desire to cut emissions and participate in the clean energy revolution. We are moving ever-faster to a world in which electric vehicles are the norm. And as investors, we are embracing this radical shift enthusiastically. The radical shift to renewable energy technologies is creating, and will continue to create, millions of jobs and untold economic opportunities. In the United States, precise statistics are hard to come by, but according to the US Energy Department, approximately 1 million people work in in the energy efficiency, solar, wind, and alternative vehicles sectors. Just under 374,000 individuals work, in whole or in part, for solar firms, with more than 260,000 of those employees spending the majority of their time on solar. There are an additional 102,000 workers employed at wind firms across the nation. The solar workforce increased by 25% in 2016, while wind employment increased by 32%. We believe these numbers are poised for super-growth over the next decade. 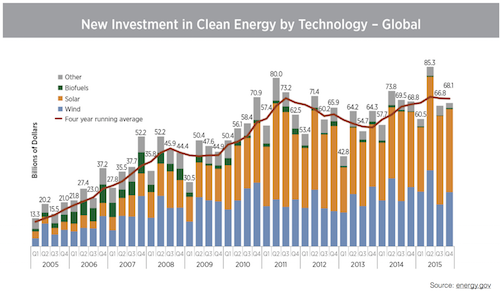 Global investment in renewables has risen steadily over the last decade, growing from less than $50 billion to $348 billion in 2015, according to the International Renewable Energy Agency (IRENA). According to nearly every measure, renewable energy is gaining ground. Accelerating the deployment of renewable energy will fuel economic growth, create new employment opportunities, enhance human welfare and contribute to a climate-safe future. Institutional investors are increasingly moving into renewable energy investment, particularly in Europe, where several pension funds have invested in large wind projects. This an historic moment in human history. We have come to a junction where it is not only feasible, but advisable and profitable to begin the transition from fossil fuels to cleaner energy paradigms. As an investor, you have to love this environment. The momentum is building. And at this point, we believe there is no looking back.